1. Alwilda2 Webb (William Fredrick1) was born November 04, 1882 in Moline Kansas, Elk County, and died September 21, 1971 in Cushing, Oklahoma. She married Stephen A. Burk May 05, 1901 in Payne County, Oklahoma, son of ? 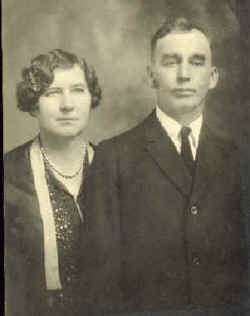 Burk and Ida Kennedy. He was born March 16, 1879 in Marion, County Mo., and died January 23, 1953 in Cushing, Oklahoma. Allie worked very hard and was a loving mother. She died of Cancer. It was said they when she died she didn't have one gray hair and not one line in her face when she passed. Burial: Zion Cemetery, Cushing Ok.
+ 2 i. Charles Lee3 Burke, born April 09, 1911 in Perry Oklahoma; died December 01, 1996 in Cushing Oklahoma. + 3 ii. Viola Burke, born January 15, 1902 in Clayton Township Oklahoma; died July 26, 1972. 4 iii. Elton Burke, born September 05, 1903 in Perkins Oklahoma; died February 05, 1987 in Washington. He married Mary Ethel Wilkinson April 15, 1939. 5 iv. Beulah Burke, born December 03, 1904 in Perkins Oklahoma; died November 27, 1970 in Cushing ok. She married Clarance Hammon; born Unknown; died Unknown in Cushing oklahoma. 6 v. Elsie Burke, born September 19, 1908 in Perry Oklahoma; died October 13, 1985 in Cushing ok. She married (1) Paul Luce; born Unknown; died Unknown. She married (2) Bill Peet. + 7 vi. Howard Burke, born June 21, 1913 in Rich Hill Mo; died August 14, 1978 in Healdton, Oklahoma. + 8 vii. Myrtle Burke, born December 26, 1915 in Cushing ok; died March 06, 1984. + 9 viii. Bobby Burke, born January 24, 1920 in Cushing ok; died August 19, 1982. 2. Charles Lee3 Burke (Alwilda2 Webb, William Fredrick1) was born April 09, 1911 in Perry Oklahoma, and died December 01, 1996 in Cushing Oklahoma. He married Opal Paris Cheesman May 13, 1932 in Cushing Oklahoma Payne County, daughter of Delbert Cheesman and Rachel Glenn. She was born February 14, 1912 in Kellyville Oklahoma, and died March 20, 2001 in Cushing ok.
+ 10 i. Charles Leon4 Burke, born September 25, 1935 in Cushing Oklahoma. + 11 ii. Deloris Jeanne Burke, born March 16, 1933. 3. Viola3 Burke (Alwilda2 Webb, William Fredrick1) was born January 15, 1902 in Clayton Township Oklahoma, and died July 26, 1972. She married Minor Warthen. He was born Unknown, and died Unknown. 12 i. Curtis4 Warthen, born Unknown. 7. Howard3 Burke (Alwilda2 Webb, William Fredrick1) was born June 21, 1913 in Rich Hill Mo, and died August 14, 1978 in Healdton, Oklahoma. He married Stella Burke, daughter of Henry Hamilton and Mary Unk. She was born May 04, 1916 in Arkansas, and died November 28, 1995 in Healdton, Oklahoma. 13 i. Donald Lee4 Burke, born Unknown. 8. Myrtle3 Burke (Alwilda2 Webb, William Fredrick1) was born December 26, 1915 in Cushing ok, and died March 06, 1984. She married Ferman Smith. He was born Unknown, and died Unknown. 14 i. Marfa4 Smith, born Unknown. 9. Bobby3 Burke (Alwilda2 Webb, William Fredrick1) was born January 24, 1920 in Cushing ok, and died August 19, 1982. He married Ileene Pendegraff. She was born Unknown, and died Unknown. 15 i. Danny4 Burke, born Unknown. 10. Charles Leon4 Burke (Charles Lee3, Alwilda2 Webb, William Fredrick1) was born September 25, 1935 in Cushing Oklahoma. He married (1) Deloris Gore. He married (2) Mary Lorine Hawley July 15, 1956 in Madill Oklahoma, daughter of George Hawley and Dorthy Briscoe. She was born April 23, 1939 in Madill Oklahoma. He married (3) Betty Tillman 1974 in Long Town, Oklahoma. She was born June 05, 1934. 16 i. Jacob Lee5 Burke, born October 07, 1973 in Stigler, Oklahoma. + 17 i. Jan Ann5 Burke, born November 29, 1960 in Durant Oklahoma. + 18 ii. Debora Marie Burke, born September 13, 1958 in Cushing, Oklahoma. + 19 iii. Timothy Charles Burke, born March 13, 1959 in Durant Oklahoma. + 20 iv. Bobby Lynn Burke, born July 1963 in McAlester Oklahoma. 11. Deloris Jeanne4 Burke (Charles Lee3, Alwilda2 Webb, William Fredrick1) was born March 16, 1933. She married John Ryan August 19, 1951 in Cushing Oklahoma Payne County. He was born January 19, 1930 in Yale Oklahoma. 21 i. Stephen5 Ryan, born March 09, 1958 in Cushing Ok.
22 ii. Lance Ryan, born July 17, 1960 in Cushing Ok.